The Pyramex safety range has been developed for the safety needs across specific industries and safety purposes. 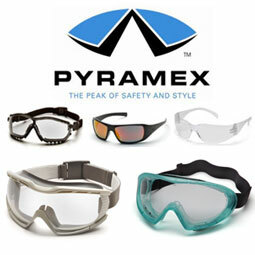 The Pyramex safety range also comes with the new, innovative anti-fog, anti-scratch lens coating - The new anti-fog technology, H2X, blocks out fog, mist, sweat and steam. As weather constantly changes from one extreme to the next, people require eye protection that exceeds the norm so they are able to keep up with the variant conditions. With H2X the customer's vision will remain optically clear in any weather element. Pyramex lenses remain unaffected by steam 15 times longer than other anti-fog treatments. The new coating will withstand weather and temperature environments where humid or cold conditions cause eyewear to fog. - ANTI-SCRATCH: H2X has an upgraded anti-scratched performance. - ANTI-STATIC: Lenses do not attract dust. - ANTI-UV RADIATION: All of our lenses provide UVA & UVB protection due to the feature of PC raw material.